Engineers at the University of California San Diego have developed tiny ultrasound-powered robots that can swim through blood, removing harmful bacteria along with the toxins they produce. These proof-of-concept nanorobots could one day offer a safe and efficient way to detoxify and decontaminate biological fluids. 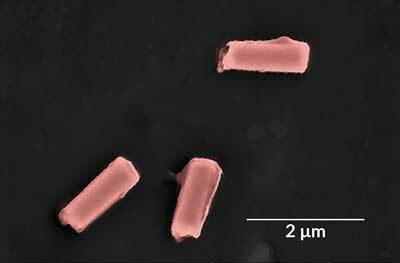 Researchers built the nanorobots by coating gold nanowires with a hybrid of platelet and red blood cell membranes. This hybrid cell membrane coating allows the nanorobots to perform the tasks of two different cells at once—platelets, which bind pathogens like MRSA bacteria (an antibiotic-resistant strain of Staphylococcus aureus), and red blood cells, which absorb and neutralize the toxins produced by these bacteria. The gold body of the nanorobots responds to ultrasound, which gives them the ability to swim around rapidly without chemical fuel. This mobility helps the nanorobots efficiently mix with their targets (bacteria and toxins) in blood and speed up detoxification. The work, published in Science Robotics ("Hybrid biomembrane-functionalized nanorobots for concurrent removal of pathogenic bacteria and toxins"), combines technologies pioneered by Joseph Wang and Liangfang Zhang, professors in the Department of NanoEngineering at the UC San Diego Jacobs School of Engineering. Wang’s team developed the ultrasound-powered nanorobots, and Zhang’s team invented the technology to coat nanoparticles in natural cell membranes. The coating also protects the nanorobots from a process known as biofouling—when proteins collect onto the surface of foreign objects and prevent them from operating normally. Researchers created the hybrid coating by first separating entire membranes from platelets and red blood cells. They then applied high-frequency sound waves to fuse the membranes together. Since the membranes were taken from actual cells, they contain all their original cell surface protein functions. To make the nanorobots, researchers coated the hybrid membranes onto gold nanowires using specific surface chemistry. The nanorobots are about 25 times smaller than the width of a human hair. They can travel up to 35 micrometers per second in blood when powered by ultrasound. In tests, researchers used the nanorobots to treat blood samples contaminated with MRSA and their toxins. After 5 minutes, these blood samples had three times less bacteria and toxins than untreated samples. The work is still at an early stage. Researchers note that the ultimate goal is not to use the nanorobots specifically for treating MRSA infections, but more generally for detoxifying biological fluids. Future work includes tests in live animals. The team is also working on making nanorobots out of biodegradable materials instead of gold.